Oxygen is an essential element in the leaching process. Efficient heap leach operations require that oxygen plus the acid or biological agent be present to dissolve the mineral deposits into the leach solution. In general, the higher the oxygen level, the greater the mineral recovery. Applying too much leach solution saturates the crushed ore and drives out the oxygen. Maximum leaching efficiency is achieved when the leach solution moves through the ore by means of capillary action. Read test report. Dry ore is composed of many fine particles. Between these particles are empty areas called pores. Pores contain oxygen. Ideally, solution percolates through the ore by means of capillary action leaving pockets of oxygen in the pores between particles. Here you can see a high reaction rate (dark red glow) because there is plenty of oxygen. Reaction activity is indicated in red. Applying too much solution hinders the leaching reaction. When solution has completely filled into the pores, the ore is said to be “saturated”. The bacteria, which are crucial to the copper leaching process, die from oxygen deprivation. Here you can see the reaction rate is very slow (light red glow) due to a lack of oxygen. Measure the moisture content of your leach pad at all times. This will give you the feedback you need to properly manage your solution application. It is recommended to use a tensiometer to measure each cell. The tensiometer measures water potential or tension. Water potential is commonly measured in units of bars (and centibars in the English system of measurement) or kilopascals (in metric units). One of the major causes of over application of leach solution is not controlling the operating pressures of your drip lines. A 15% variance in pressure from the recommended operating pressure will cause a 15% over or under application of solution. We recommend using individual regulators to monitor pressure of each line which gives you the best control of pressure. Alternatively, you can use a larger pressure valve for an entire zone. If your emitters plug you lose production because the application rate of solution in that area will change. Furthermore if a high number of emitters are plugged it increases the system pressure and causes the remaining emitters to over apply solution. Over saturation is associated with close spacing of emitters. 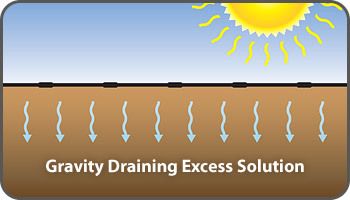 By spreading out the wetting patterns it allows for increased capillary movement of solution and reduces saturation. 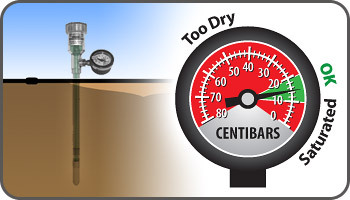 Wetting diameter is usually 30” (76 cm) in diameter or more, except in extremely sandy soils (like beach sand). It is always surprising how far the solution spreads underground and there are virtually no dry spots between emitters below the surface. 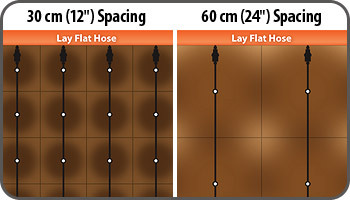 Typical spacing would be 2 liter at 18” (46 cm), 4 liter at 24” (60 cm) and 8 liter at 32” (80 cm) depending on desired application rate. Also, significant cost savings result from spreading out the emitters and reducing emitter line purchase proportionately. If your pad does become over saturated it is wise to let it dry out. Allow time for gravity to drain the excess solution from the pad. When the draining stops, the pad will remain at field capacity but air with oxygen will have filled the pore spaces. Finally, reapply the solution at the proper rate. If you have oversaturated Ore with a high silt/clay content you probably have sealed the “soil”. Once this happens solution can no longer penetrate and consequently your leach solution application is very uneven. 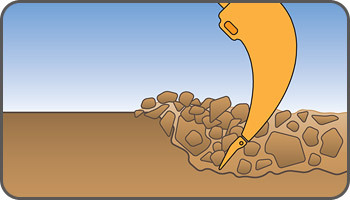 If you have sealed the pad it is recommended to use a “ripper” to break up the sealing close to the surface.